Researchers from the Queen Mary University of London School of Engineering and Materials Science have developed a process for manufacturing self-reinforced polylactic acid (PLA) composites. Preliminary tests confirm the mechanical properties of this material are comparable to non-biodegradable PLA composites and therefore may be amenable to semi-structural applications such as automotive, general engineering or consumer product markets with improved performances, durability, cost performance and processability. 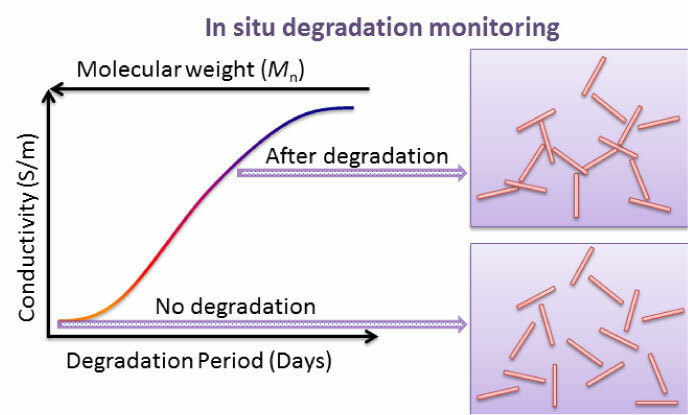 An in-situ degradation monitoring system has also been developed through the introduction of CNT into the skin layer, which provides on-line information regarding structural safety and makes it a good candidate for applications in smart biocomposite products. Environmental legislation, public concern, and waste management are all increasing the pressure on manufacturers of materials and end-products to consider the environmental impact of their products at all stages of the life cycle. At this moment, ‘eco-design’ or ‘designing for recycling’ becomes an important part of our lives. The issue of recycling is of particular relevance to the automotive industry because of a new European Union (EU) directive on the end-of-life of vehicles (ELV) stating that by 2015 vehicles must be made of 95% recyclable materials. The Polymer Technology Group at Queen Mary University has a successful track record in the area of “self-reinforced polymer” composites or “all-polymer” composites. In a collaborative research programme together with Eindhoven University of Technology and Lankhorst-Indutech from The Netherlands, the group co-developed technology the all-polypropylene self-reinforced polymer that was commercialized in 2007 under the names of PURE® and Tegris®. Research into all-polymer composites has since moved towards biopolymer polylactic acid. This work is carried out within the project HIGHBIOPOL, together with Nanocyl S. A. and Universite de Mons from Belgium. The main advantages of using biopolymers is to create performance products from sustainable resources, competing with fossil hydrocarbon sourced polymers, at the same time leaving open the possibility of biodegradability and composting as an alternative end-of-life option in additional to mechanical recycling. 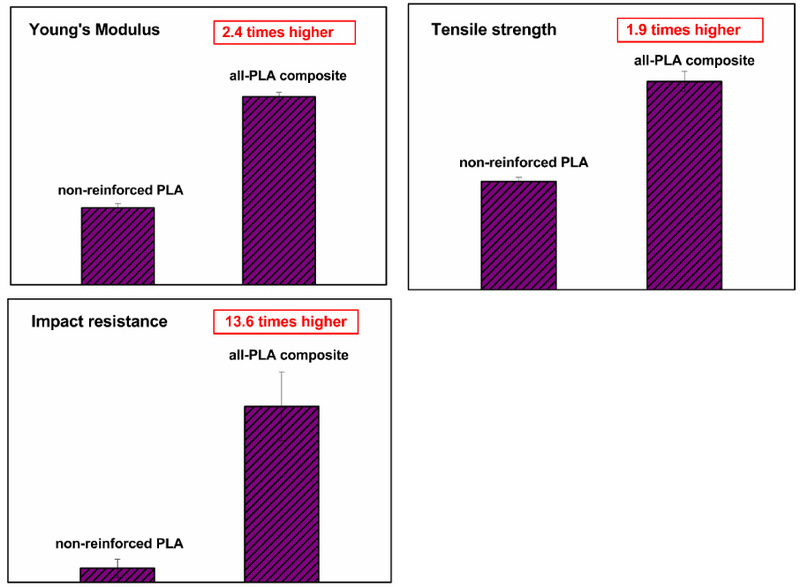 Preliminary properties of the all-PLA self-reinforced polymer (SRP) are compared with commercially available all-polypropylene SRPs. Whilst the tensile strength is somewhat lower its tensile modulus and impact strength are comparable to this non-biodegradable plastic. The key technology is the concept of coextruding multilayer tapes consisting of a highly oriented PLA core (reinforcement phase) covered by a thin PLA skin (matrix phase) with a lower melting temperature. Subsequent solid-state drawing orient the polymer chains along the tape’s axis to improve strength and stiffness. 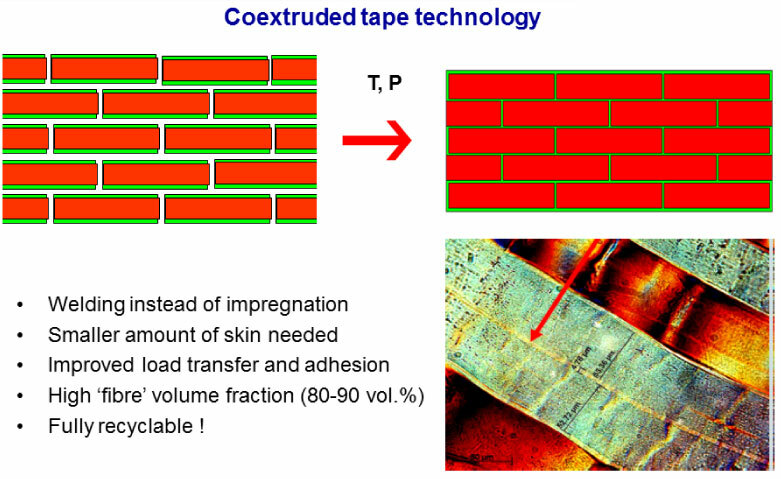 During consolidation, the skin layers are selectively melted to weld the PLA tapes together to form a composite structure. These PLA tapes can be woven into fabrics, which subsequently can be moulded into sheets and thermoformed into 3D products, such as shell structure, beams or sandwich panels when combined with a PLA foam core. The obtained all-PLA composite holds very strong future promise for potential applications as high-performance recyclable and biodegradable materials. The outstanding tensile strength and impact resistance make all-PLA composites a good candidate for (semi-) structural applications such as automotive, general engineering or consumer product markets with improved performance, durability, cost performance and processability. For PLA based product to be used in more demanding engineering applications, the important issue of degradation during the product’s life time needs to be addressed. It is for this reason that monitoring of degradation during usage could prove to be of vital interest. The QMUL team pioneered the use of minute amounts of carbon nanotube (CNT) into skin of all-PLA composite as a means to monitor degradation. As the morphology of the polymer changes during degradation, it results in a change of the filler network, thus leading to a change in electrical resistivity. To demonstrate what is possible from all-PLA composites, a football shin pad was produced from the all-PLA composite. The direct forming route to manufacture the shin pad of all-PLA composite makes it an interesting alternative to stamping pre-consolidated sheets, as it eliminates an expensive belt-pressing step normally required in the manufacturing of semi-finished sheet products.